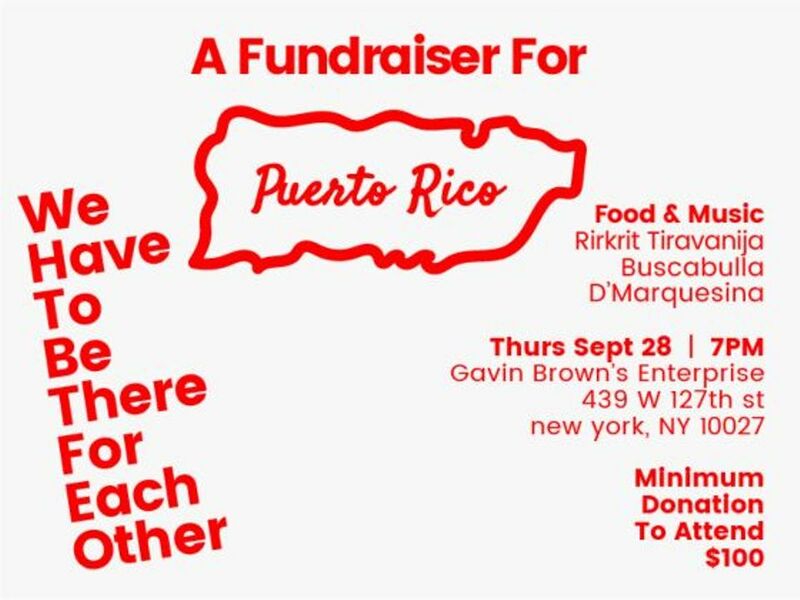 Tonight (28 September), the Harlem gallery space of Gavin Brown’s Enterprise will host a fundraiser to contribute to disaster relief in Puerto Rico, devastated from the category four Hurricane Maria which hit the island last week. The event and online fundraising campaign, We Have to Be There for Each Other, were launched by Glorimarta Linares, who has worked with the Argentina-born artist Rirkrit Tiravanija for 12 years. Linares and Tiravinija have teamed up to organise tonight’s event. Tiravanjia will cook a seven-course menu, and music will be provided by a line-up of New-York based Puerto Rican artists: D’marquesina, the DJ duo of Linares and Héctor Arce-Espasas, and Buscabulla, the experimental pop band of Raquel Berrios and Luis del Valle. “We’re feeling really hopeless over here… This is as much as we can do right now,” says Linares, who was only able to get in touch directly with her family today. The online fundraising campaign, which will continue after the event, was launched on 26 September and has already raised around $14,000 towards its goal of $20,000, as of this morning. Meanwhile, Tambaran Gallery has turned its new exhibition into a fundraiser for Mexico, which was recently struck by two earthquakes. Maureen Zarember, the gallery’s owner, says she will give ten percent of sales from The Poetic Body (until 31 October), a solo show of the Montreal-based Mexican artist, Damián Siqueiros, to disaster relief.